If you’re looking for a new pair of headphones, you may have come across Sony, which has become well known for high quality noise cancelling and wireless over-ear headphones. We’ve been mightily impressed by Sony’s over-ear headphones recently, some of which offer outstanding noise cancellation and stunning levels of audio quality. However, Sony’s wired and true wireless earbuds like the WF-SP700N earbuds haven’t blown us away so far, so if you want to buy a pair of the best Sony headphones, it’s probably best to stick to its over-ear offerings – this is where the company truly excels. So, if you’re thinking of buying a pair of Sony headphones, read on for our roundup of the best Sony headphones we've reviewed, ranked from our favorites to the ones we're not so keen on. The Sony WH-1000XM3 are our favorite noise-cancelling headphones two years in a row – and not just because they're excellent at blocking out environmental noise. They're great for audiophiles, thanks to aptX HD and Sony's LDAC, two of the best ways to listen to Hi-Res Audio, and as they're wireless, you don't need to mess around with cumbersome wires. The WH-1000XM3's also come with Google Assistant integration, and as of January this year, Amazon Alexa integration, which means you have instant access to a voice assistant wherever you are. This alongside the stellar noise-cancellation capabilities makes the WH-1000MX3s perfect for commuting, whether you need a pair of cans to get your through your daily journey to work, or a long haul flight. If you can still find these headphones, the previous generation of Sony's noise-cancelling cans are still brilliant – and you may be able to find them slightly cheaper than the current model, the WH1000-XM3s. 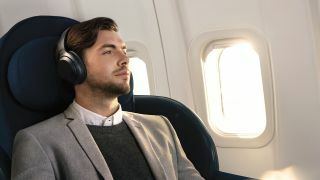 At around the same price as the Bose QC35s, the Sony WH-1000XM2 offer better features, including an ambient noise mode that only lets in mid-to-high frequency tones (announcements over a loudspeaker, for instance) and Quick Attention mode that allows you to let in all outside noise without taking off the headphones. Like the WH-1000XM3s, they also support aptX HD and LDAC for Hi-Res audio – in fact, all of the features mentioned above can also be found in the most recent model. Aside from a few cosmetic changes, the main difference between the two is that the WH-1000XM2s don't come with voice assistant integration – so if that's important to you, stick to the the WH-1000 XM3s. Despite the fact they're now a few years old, they're still a top option for noise-cancelling headphones – even if Sony has upgraded its headphones a few times since. Like the newer models, they support Hi-Res Audio, and sport features like Quick Attention mode, ambient noise mode (although we did find it can be temperamental), and are very adept when it comes to noise-cancellation. So, why would you buy the oldest generation of Sony's noise-cancelling cans? Well, you'll likely find that retailers have cut the prices since the newer models launched, which means you could get yourself a fantastic deal on a still very capable pair of Sony headphones – if you don't mind losing the inbuilt voice assistant and quality of life updates offered by the WH-1000 MX3s. Although these wireless headphones are a couple of years old now, they still offer good value for money – and chances are, you'll be able to find them for cheaper since Sony has released more recent models. When we tested them, we were impressed by their sport, sturdy design, and long battery life. The slightly cramped soundstage probably won't appeal to audiophiles, but a reliable Bluetooth connection and affordability means these wireless headphones could be a good choice if you're looking for cable-free listening for under $150 (£150, around AU$270). These true wireless buds may be a little bulky, but this is offset by their noise-cancelling prowess and relatively long battery life. When we reviewed them, the WF-1000Xs did an admirable job at cancelling out most ambient noise. Like other noise-cancelling headphones, this effect is most pronounced on low frequency rumbling, making them a good choice if you are looking for buds to take on public transport. The audio quality provided by the WF-1000Xs is decent, with a generally well-balanced sound across the high, mid, and low frequencies. If you don't like wired headphones but want the security of a neckband , the Sony WI-1000X are a great in-ear alternative. The inclusion of aptX HD support makes the Sonys one of the best wireless headphones we’ve heard, and they provide a good level of noise-cancellation, making them a good choice for commuting. While battery life may just be average at 10 hours, the WI-1000X are a great set of headphones for audiophiles on the go. With a low price, long battery life, and lightweight feel, there's a lot that these headphones do right, but subpar audio performance and a flimsy-feeling build means that the MDR-ZX330BT don't quite make the list of the best mid-range headphones. Still, if you need a low cost, light pair of headphones with a long battery life for commuting, they could be a good choice – just don't expect to be blown away by the audio quality. Sony’s WF-SP700N are a middling pair of true wireless headphones. They’re lacking in clarity and in noise-cancellation prowess, but at least they’re comfortably to wear for extended periods and don’t fall out easily. Still, they're pretty expensive, and you can do better with cheaper models – read our roundup of the best true wireless earbuds for our pick pf the best Apple AirPod alternatives. Designed for sports, these wireless buds have an IPX4 sweat resistance rating, noise-cancellation and an ambient sound mode, which mean you can switch between blasting your music and listening to your surroundings when on your run. However, we found that the WI-SP600Ns didn't provide the best fit, which could be a problem if you intend to wear them while working out. Saying that, audio performance was decent, if not mind-blowing, and having the ability to change the EQ settings via the app is a nice touch. Even so, we'd probably recommend the 1More Triple Driver In-Ear Headphones over these buds from Sony if you're looking for an affordable pair of earbuds. Sony seems to target two different demographics with its headphones – the true audiophile, and the beat-hunting bass fiend. The Sony MDR-XB950N1 is certainly aiming to tempt that latter group, and if you run through the spec sheet the cans look like a winner: you get active noise cancellation, 22 hour battery life and a comfortable over-ear design. However, if you prefer your music to be more well balanced, you probably won't like these extra bassy cans. When we reviewed them, we found the bass frequencies overpowered the mids, which can be a real problem if you're looking for a faithful replication of your music.